Overview: Many people know that Cranberry, as a herbal medicine, helps prevent recurrent urinary tract infections. 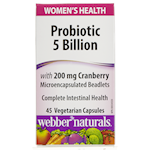 Each Life Brand Probiotic Cranberry formula capsule also contains 2.5 Billion colony forming units of bifidobacterium longum, a species of friendly bacteria that temporarily modifies gut flora. 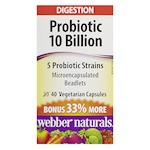 Together they support your digestive and urinary tract health– all in a convenient one-a-day vegetarian capsule. 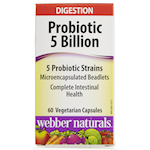 Benefits: Probiotics that temporarily modify gut flora. Source of probiotics. 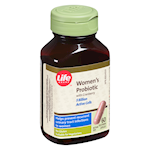 Helps prevent recurrent urinary tract infections (UTIs) in women. Provides antioxidants for the maintenance of good health. 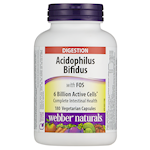 This product contains 1.6 calories and 0.22 mg of sodium per capsule. No soy, sulphites, preservatives, artificial flavours or colours. Suitable for vegetarians. 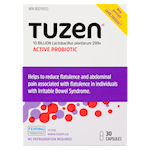 (ADULTS): Take 2 – 3 capsules daily or as directed by a health care practitioner. Take at least 2-3 hours before or after antibiotics. Use for a minimum of 4 weeks to see beneficial effects. Keep out of reach of children. This product has come into contact with milk and gluten. Do not use this product if you have milk or gluten allergy. Consult a physician prior to use if you have a history of kidney stones or are taking blood thinners. Consult a physician if symptoms persist or worsen. Discontinue use and consult a physician if symptoms of digestive upset (e.g. diarrhea) occur, worsen, or persist beyond 3 days. Consult a physician prior to use if you have nausea, fever, vomiting, bloody diarrhea or severe abdominal pain. Do not use if you have an immune-compromised conditions (e.g. AIDS, lymphoma, patients undergoing long-term corticosteroid treatment).